Where do your thoughts travel when you read the words walking trails, miles of beaches and cactus? California, Cabo San Lucas, Aruba, Australia, or maybe Spain? These locations and more, easily come to mind, but then add unobstructed views of the Manhattan skyline to the description and you may be stumped. Where can you find these unique features? Destination – Sandy Hook, NJ. Sandy Hook, part of the Gateway National Recreation Area, delivers these treasures, and so much more. The view of Manhattan and the Verrazzano-Narrows Bridge from a Sandy Hook beach. The United States (US) National Park Service manages the Gateway National Recreation Area. It comprises three distinct, and separate geographic sections: Jamaica Bay (NY), Staten Island (NY), and Sandy Hook (NJ). For centuries, the Sandy Hook area served as the gateway for many people entering the US. 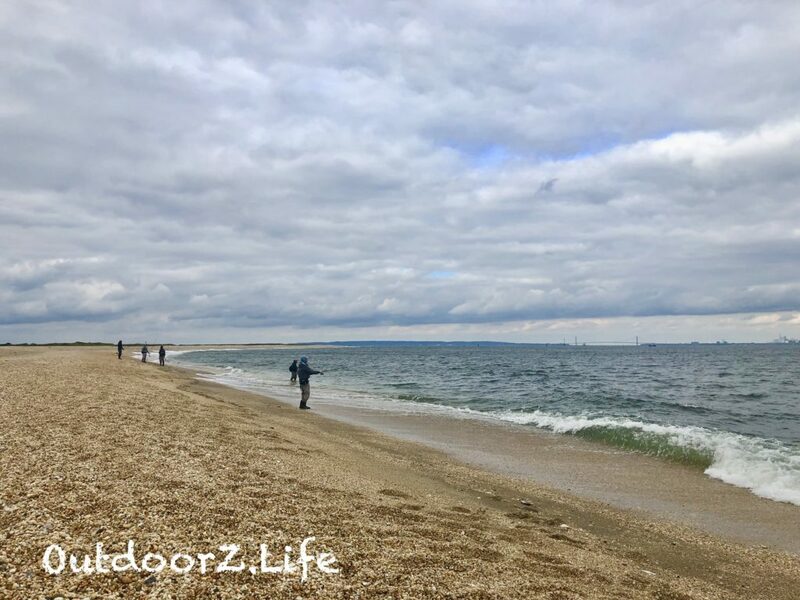 On a sunny but windy day in October, Sandy Hook created a personal gateway to a weekend exploration for me and my husband. 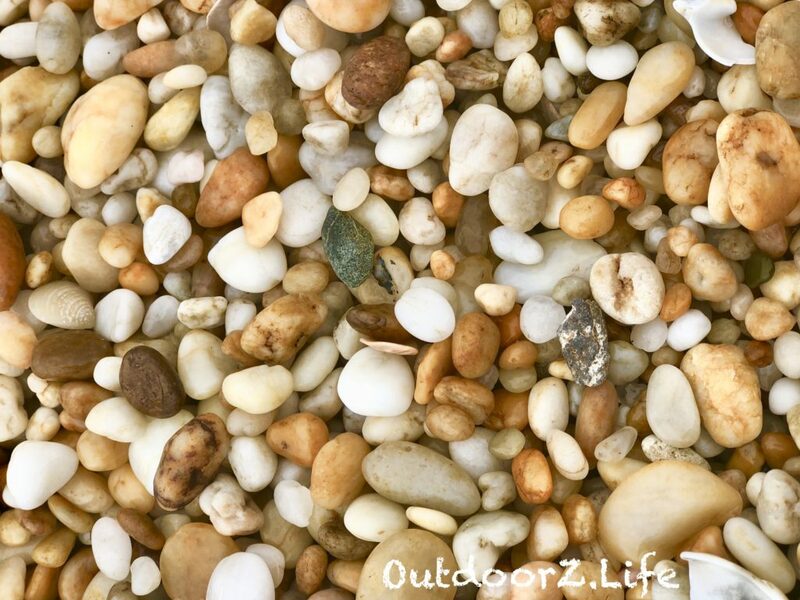 Pebbles on a Sandy Hook beach. After the Labor Day holiday, entrance to the park is free. When we visited in October, crowds no longer filled the park and the attire of fleece pullovers and wind breakers replaced bathing suits and beach towels. We entered the park by car and, after a few lingering stops, found a parking area at the northern end of the peninsula. The Sandy Hook beaches surprised us when we passed through the grass covered dunes and saw a cactus! The beach sands changed to rounded pebbles as we approached the shoreline. After wandering and searching for seashells on this expansive beach, we settled on a spot to unpack our picnic lunch, watch the fishermen and enjoy our multi-billion-dollar view! Sandy Hook Light, the oldest working lighthouse in the US. After seeing a fisherman catch and release a Striped-Bass, we greeted him and asked him about the types of fish he sought to reel in. 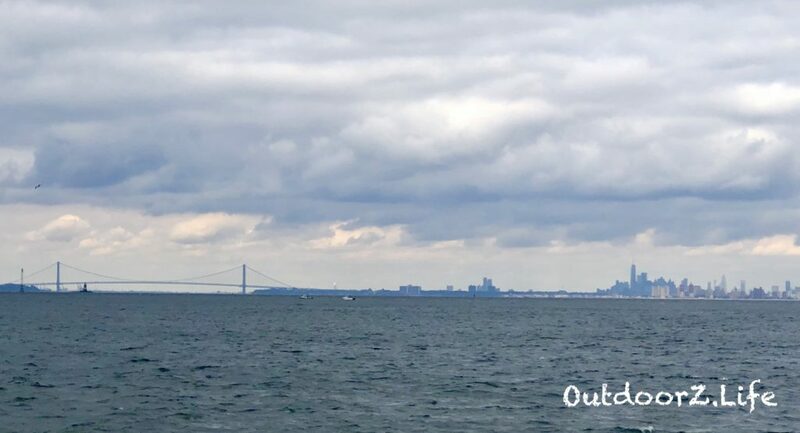 We enjoyed a friendly conversation as he shared details about the area and his Sandy Hook fishing experiences, which included his notes on the best times to fish for migrating species. He explained that the fish we saw jumping just offshore were schools of migrating Albacore following and feeding on smaller fish. Officer’s housing at Fort Hancock and the bay as seen from atop the Sandy Hook Lighthouse. We then drove past an active Coast Guard Station and parked at Fort Hancock, a decommissioned US Army fort. The military significance of this fort dates to the Revolutionary War and continued until 1974. 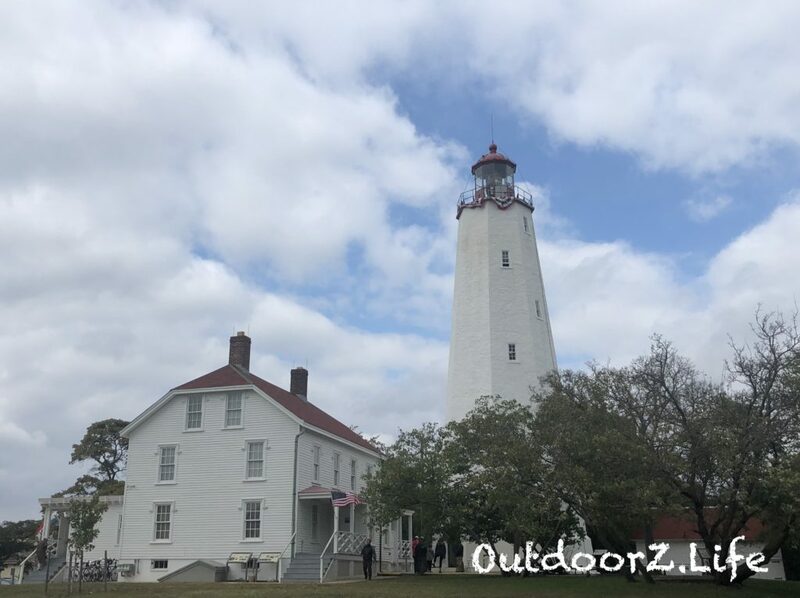 Highlights of the northern tip of the park also include the lighthouse, called Sandy Hook Light, and the History House. Sandy Hook Light is the oldest working lighthouse in the US. After climbing its 95 spiraling steps and then a 9-rung ladder, we reached the small area at the top which houses the original lighthouse lens. Of course, huge windows surround the top enclosure and provide visitors incredible views of the fort, the peninsula beaches, and New York City. Sandy Hook fishermen pursuing Albacore. An unfortunate aspect of the park is the row of deteriorating homes called Officer’s Row. In need of great repairs, they line the bay side of the fort. 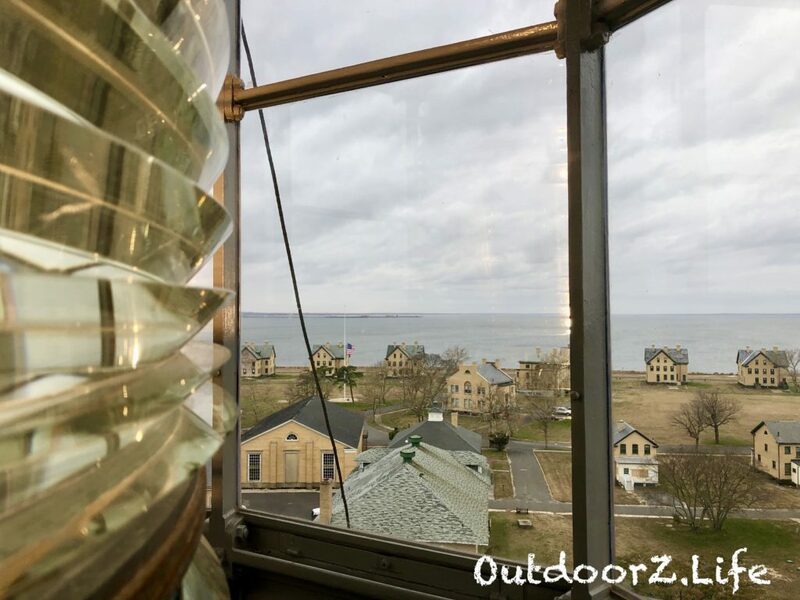 The view of these historic homes is stunning, especially from atop the lighthouse. A few houses are renovated. One house, a duplex, is available to rent. I imagine it would be an incredible vacation experience! At one renovated home, called the History House, we met a volunteer with a passion for the area; she gave us the gift of a history lesson including information about the efforts to restore the run-down buildings. This gem should be renewed, refreshed and restored so it can offer a treasure of history lessons to future generations. We enjoyed our first visit to Sandy Hook, but left knowing that the park provided more for us to explore. The next month, we returned to the park with my parents. My 78-year-old mother climbed the lighthouse on that trip! Even with a few raindrops and moments of blustery winds, our visit succeeded in stirring our curiosities and our spirit of outdoor adventure. We expect to visit Sandy Hook again to take advantage of the walking and biking trails, kayaking trips, history lessons and yes, those billion-dollar views preserved and afforded to us everyday folk who find refreshment in the OutdoorZ. What an intriguing beginning that does not disappoint with all the information and descriptions to follow. Wish I lived close enough to visit.